Try as I might, it seems the odds of my getting a shot of these birds good enough to post straight out of camera runs way over one-in-a-thousand. 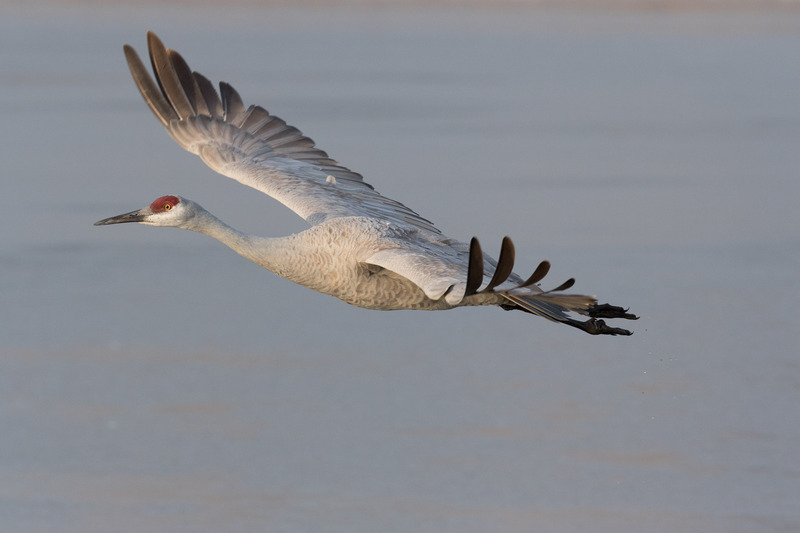 A sharp shot with good exposure and good composition of these birds in flight is tough to catch. I rarely get one I feel is good enough to post without some cropping, sharpening, and other enhancements. This is my favorite of the 873 I shot this morning. The conditions this morning were exceptionally good. It was cold enough to freeze the pond overnight. The birds were flying out a little later than usual putting the sun a little higher above the horizon than usual when they fly out. A slight overcast to the sky softened the light just a tad too. Plus the birds were flying exceptionally low over the ice this morning (one even flew out so low over my head I ducked! ), possibly because of stiff muscles and reduced lift or extra drag from the frost on their feathers. Or maybe they just felt like it. It's such fun when things come together like this. This morning I was shooting with my EF 200-400 f/4L IS USM EXT 1.4X lens on my new Canon 7D Mark II body. I just got this lens back from a repair at Canon CPS. Back in late October I managed to tip my tripod over onto concrete damaging the focussing assembly and group 4 lens assembly. That was not a good day but all is well now with my favorite birding lens! I've missed it.